Bikes can be a big investment, so you want to make sure that your pride and joy is kept safe and secure. Bike storage is a major concern for any bike owner. You do not really want the inconvenience of having to wind your way around your bike every time you walk through the entrance to your home, but how else can you keep it safe and out of the elements? The good news is that you do have options, when it comes to storing your bike. Some of them can actually be cool ways of adding a fun decorative feature to your home. If you are looking for a fun and funky interior décor idea, and a place to store your bike, then why not combine the two. 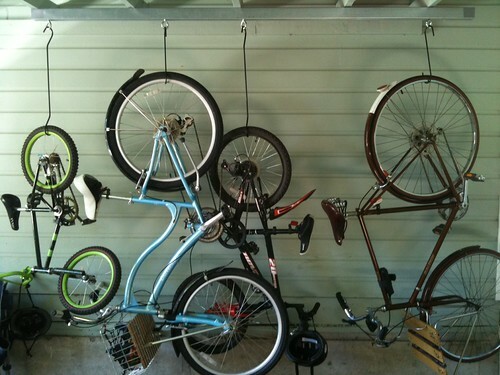 Bike racks are permanent wall fixtures where you can hang one or two bikes. This means that you bike is out from under your feet, it's safe and it creates a talking point when your friends come over for dinner. This is probably not an ideal solution if you have a very small space, but it can look cool, and it's simple. All you have to do is attach a bike hook to the wall and it keeps hold of the front wheel of the bike, while the back wheel simply rests against the wall. You need to remember that the bike itself sticks out from the wall, so you should allow for sufficient space. As you might expect, a bike hoist enables you to hoist your bike up, and suspend it from the ceiling. It's an excellent way of using space that is not currently utilised. You can use a bike hoist in your home, and make a feature out of it. You can also use a bike hoist, or multiple hoists, in your garage. You do not need to have a huge garage to be able to store your bike in it, as well as housing your car. There are some creative ways in which you can make the most of your garage space. An excellent bike storage solution is to use over bonnet storage units. After all, you are probably not going to do anything else with the space above the bonnet of your vehicle. Being able to store your bike safely and securely is a major concern, especially if you have invested several hundred dollars in the machine of your dreams. As you can see, there are more options than you might think. You can even use your bike as an interior décor feature in your home, when you are not out riding it. You do not even need to have a lot of space to do so; you just need to get creative.